Following traffic laws and engaging in safe driving practices can help reduce the risk of being involved in a serious accident, but, even when you're on your best behavior behind the wheel, accidents can still happen, particularly if other motorists make poor driving choices. Hundreds of thousands of motor vehicle accidents occur in the United States each year and Delaware is no exception. In 2015, there were more than 24,000 traffic accidents in the state, resulting in more than 8,000 people injured, 133 deaths, and economic losses in excess of $641 million, according to Delaware's Annual Traffic Statistical Report for 2015. If you were involved in an accident in Delaware, understanding your legal rights and being able to seek the medical and emotional treatment you need can be essential to your overall recovery. After an accident, follow these important steps to build a strong case, and safeguard yourself and your loved ones. Don't risk criminal hit-and-run charges. Never drive away from the scene of an accident, even if the crash was relatively minor and no one was seriously injured. If you can, move your vehicle to the side of the road, where it won't interfere with traffic. If this isn't possible, turn on your vehicle's hazard lights and set up flares, reflective triangles, or cones to alert other drivers. Even if an accident seems minor, it's wise to check yourself and your passengers for injuries as soon as you're able. Once you've assessed any injuries in your own vehicle, check on the drivers and passengers in the other vehicles involved in the accident. Call an ambulance if anyone needs medical assistance and don't risk moving anyone who's seriously injured. Promptly report the accident to law enforcement and request a copy of the police report for your records. In Delaware, drivers are required by law to report accidents that take place on public roads; result in injury, death or more than $500 in property damage; or appear to involve a driver under the influence of drugs or alcohol. Call your insurance company to report the accident as well—waiting too long may result in the denial of your claim. 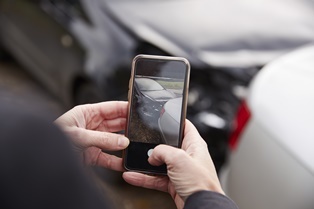 While waiting for the police to arrive at the scene of the crash, use a camera or a smartphone with a camera to photograph the accident scene. Photograph injuries you or your passengers sustained, as well as vehicle damage, and any relevant road or weather conditions. These photos can serve as powerful evidence for your insurance company or a jury if your case goes to trial. Provide your contact and insurance information to the other drivers involved in the crash and take their information in return. While you're at it, get contact information from the passengers in the other vehicles, as well as anyone who witnessed the accident. What you do and say immediately after an accident can come back to haunt you. Don't let it. Fight the urge to apologize or say things like, “I didn't see you”—even if you think the accident might be your fault. Likewise, avoid blaming other drivers. Keep discussions of the accident between you and the police, or you and your attorney, and refuse to sign documents other than the official police report. Just because you weren't whisked away in an ambulance doesn't mean you weren't injured in the accident. As soon as the police clear you to leave the scene, head to an urgent care or the emergency room for an examination so that you can get your injuries on record. This step is absolutely essential, particularly if you plan to move forward with an injury-related insurance claim or lawsuit. Save any and all documents related to the accident, including medical bills and vehicle repair receipts. If you were seriously injured, it may also be helpful to keep a journal of how your injuries affect your ability to complete day-to-day tasks. Seasoned Wilmington, DE personal injury attorneys can look out for your interests and help you pursue compensation for a wide variety of crash-related damages. To discuss the details of your case, and learn more about the insurance claims or civil litigation process, contact the Morris James Personal Injury Group to schedule a free case consultation.